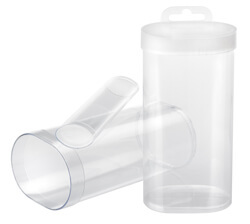 The oval shaped packaging container is one of our most unique designs. When you want your product to draw attention on the retail shelf, consider the oval tube package. Create an entirely clear container with a clear cap or a plug and the packaging container is ready to show off and protect your product. Let this unique shape draw attention to your product inside!